Athens Marathon. The Authentic. The name reflects the unique world position of the event. 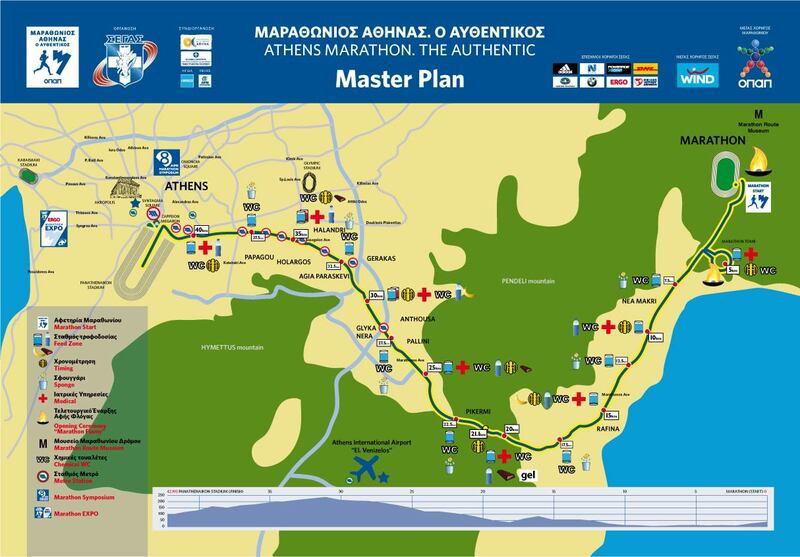 Not just a classic Marathon of 42.195km but the only marathon held on the authentic course from Marathon to Athens. It is the Authentic Marathon. Among all the Olympic sport events, the Marathon stands out as it was born by a true historic and heroic event. It was a true triumph accomplished by a news bearing foot soldier from ancient Athens, who announced - with his last words - the victory of the Greeks against the Persians during the Marathon Battle in 490 BC. The Marathon became one of the most competitive events during the revival of the Olympic Games in 1896. A Greek athlete named Spyros Louis, running what has ever since been referred to as the Original Marathon Course from the ancient city of Marathon to the Panathinaikon Stadium in Athens, won the gold medal of the first modern Olympic Games and became a legend of Greek and International Athletics. The Marathon has always had a prominent place in the hearts and minds of sports enthusiasts, as it represents the highest effort where the human body, soul and mind are tested to their limits as the runner presses himself/herself to reach the finish line. Thousands of runners from all over the world participate in the Athens Marathon each year. Apart from the sporting experience, they have the chance to enjoy the traditional Greek hospitality, discover the fascinating landscape and explore a city which is constantly improving its standards. The Athens Marathon starts in Marathon town. From 11-17km the course is uphill in parts, with further uphills through to around 31km. The course then descends into Athens and is fairly flat the rest of the way, finishing in the Panathinaikon Stadium home to the 1896 Olympics. In the case where no finsihing time is provided, runners are automatically placed in one of the last three blocks. Runners will be allocated to starting areas according to their bib number and colour and this is based on your times provided on your entry form. Runners are then sent off in waves. Allocation is based on the runners' finishing times of the last three years (2014-017) as stated on the registration form. Race packs are collected from the Expo Registration Centre. All times as above except for Saturday when registration closes at 18:00. The Marathon is concluded at 17:40pm. Runners who exceed this time limit will have to continue the race on the pavement in order to ensure the safety of the other participants. All runners must follow these instructions. T Any runners on the course after the cutoff times do so at their own risk. When the time limit (see below) expires, vehicle circulation will be partly allowed in the streets. Your timing chip will be included in your race pack. Split times will be recorded every 5 kilometres and at 21.100km (half way). Any runner for whom no time is shown at the Start, the split timing zones and the Finish, will be disqualified. There are kilometre (km) markers at every kilometre of the course. Toilets are available at the start and the finish area, as well as at all support stations along the course. Medical stations will be situated at the Start, Finish and along the course An ambulance follows the last group of runners on the course. The split times of the runners will be available on the event website. Photo services will be provided by the world renowned photographers MarathonPhotos.com. All participants will be able to download or purchase their photos a few hours after the event from the Marathon-Photos.com website. Buses will depart from six different stations in the centre of Athens and will be available between 5:30-6:45am. After 6:45am no buses will be provided by the Organising Committee. All participants must be at the Marathon start venue at least one hour in advance (8:00 a.m. at the latest). All participants need to put their clothes and other belongings in the kit plastic bag they will be given along with their bib number at the Registration and Distribution Centre. All bags must have your number attached to them. Do not leave items of value in your bag. The Athens Marathon Organising Committee bears no responsibility in case of loss or damage of any valuable items in the bags. No bags, backpacks, etc will be accepted other than the special bags provided to the runners by the Organising Committee. Bags must be deposited with the volunteers at the DHL vehicles located near the start venue, no later than 30 minutes before the start of the race (8:30 a.m. at the latest). After the race, you may collect their personal belongings from a specified area on Arditou Street, 100 metres on the left after the exit from the Propylaea of Panathinaikon Stadium. You must show their bib number in order to collect their bags. Departure or continue on your Greek odyssey! 2019 Athens Marathon. The Authentic. Athens is the home of the Marathon…. run on the Authentic course. We’ve got some authentic prices to take you to the home of the marathon, staying in your choice of 4* or 3* Accommodation. Whatever your plans, whatever your budget we can provide an Entry and Accommodation Package to suit. 5d/4nts 4* Accommodation: from $880 per person, twin share ($1420 single). ask us about other options for your stay in Greece! A non-refundable payment of $350 is required to secure your Athens Marathon travel, entry and accommodation package.